Carolina Panthers star quarterback Cam Newton is a finalist in the vote to appear on the cover of Madden NFL 13. He's up against Detroit Lions star wide receiver Calvin Johnson. After nearly a month of competition between 32 top NFL players in a tournament bracket-style contest, spread over four previous rounds (this is the fifth and final round) with fans given a week to vote in each round, it's now down to two of the most exciting offensive players in the league. Superman (Cam) versus Megatron (Calvin). They're both Georgia natives, and at ages 22 and 26, whomever doesn't win the cover this year, will surely have several more opportunities in the future. As a Carolina kid (SC native), current Charlotte resident, and Panthers fan since the team began in 1995, I'm absolutely rooting for Cam to win. He would be the first player to ever grace the prestigious video game cover after just one year in the league (Madden has featured a top NFL player on the cover each year since 1999). And it would be another milestone that No. 1 is bringing to the Panthers franchise (wide receiver Steve Smith is the only other Panthers player who's ever come remotely close to Madden cover consideration). Until Cam's arrival last year and amazing rookie season, Charlotte hadn't possessed a top-tier, superstar athlete, whose fame and marketability is as big as his play, since Larry Johnson during the Charlotte Hornets heydays of the 1990s. Cam is quickly eclipsing that. The first Madden video game, then called John Madden Football, debuted in 1988. That was around the time my brother and I got our first Nintendo video game console. Video games, which I haven't played regularly in several years, sure have changed a lot since then. When Madden games today are played on a high-definition TV, they can almost be confused for a real-life NFL game. It continues to be a top-seller and is approaching the 100-million-copies-sold plateau. A lot of dudes anticipate the release of the new game each year the way some people crave the next iPhone. Many chicks know the game as the thing that keeps their guy from spending quality time with them. The Madden NFL 13 cover vote finals between Cam and Calvin started yesterday and ends Wednesday, April 25. The winner will be revealed that day at 5 p.m. on SportsNation on ESPN2. 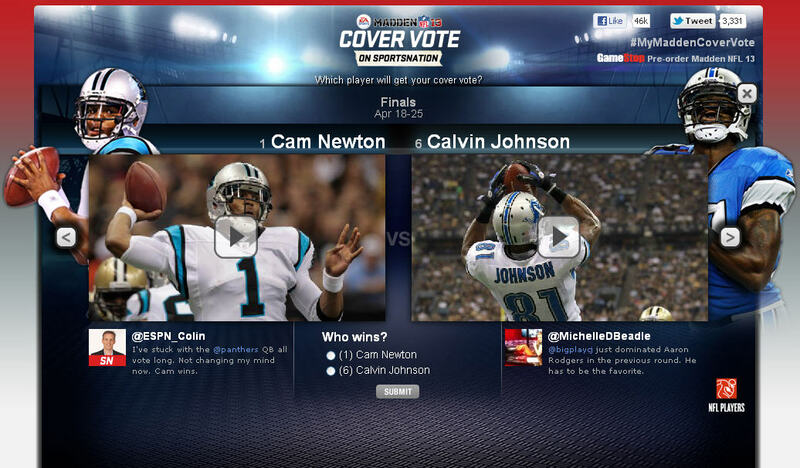 Go to espn.com/maddenvote now to vote for Cam. That is, unless you believe in the whole Madden Curse thing. I don't. By the way, did you know a statue of Cam was unveiled last week at Auburn University? The Tigers honored their three Heisman Trophy winners--Cam (2010), Bo Jackson (1985), and Pat Sullivan (1971)--with life-sized statues. Watch the video here. UPDATE 4/20/12: In this video below, Cam Newton--after running through a long list of aliases--explains why he deserves to be on the Madden NFL 13 cover and challenges his co-finalist Calvin Johnson to play him in the video game. Plus, in what he's calling the CAMpaign Challenge, he invites you Madden gamers to play him by sending an email to playcam@cam1newton.com with your full name, phone number, and gamer tag, and he'll select one or some of you.